The state of emergency directs Washington state agencies and departments to use their resources to assist affected areas in order to respond and recover. 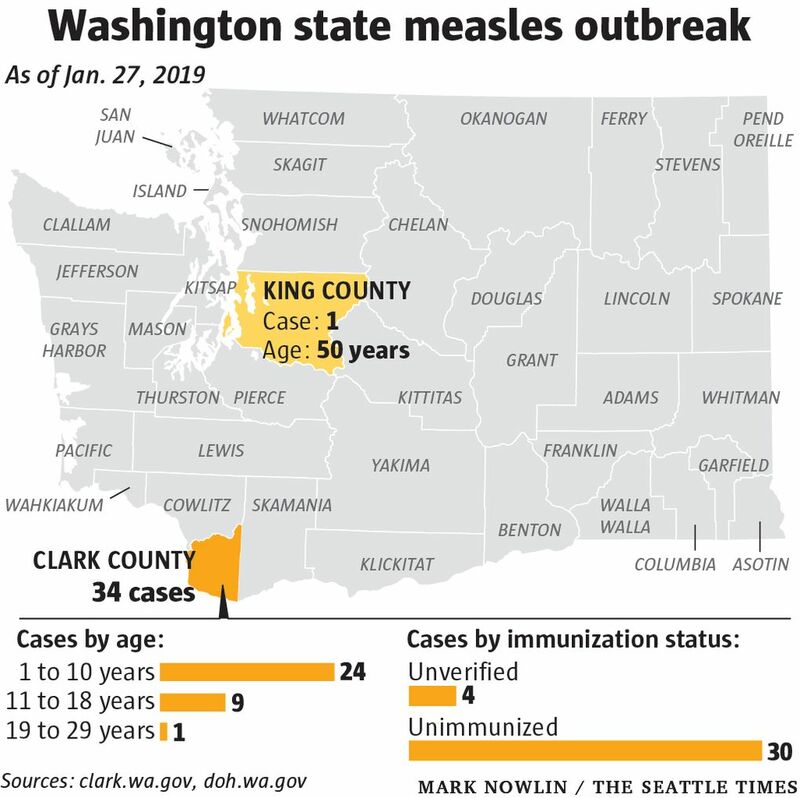 As of Friday afternoon, there were 30 confirmed cases in Clark County, and a single known case in King County after a man in his 50s contracted measles and was hospitalized after a recent trip to Vancouver, according to the state Department of Health (DOH). Clark County Public Health reports an additional nine suspected measles cases. State agencies will work with local health departments and emergency management teams to help respond to any needs, including epidemiology to verify suspected cases, technical assistance to educate the public on measles outbreaks and guidance on how to protect vulnerable populations, according to Tara Lee, spokeswoman for the governor. Local governments would have to request such assistance. The proclamation also allows the state to ask for medical resources from other states. Additionally, Washington’s Emergency Operations Center is coordinating resources to support the Department of Health and local officials to reduce the impact of the outbreak, and assess for any possible long-term effects. People who lack vaccinations may unknowingly spread the disease since it is contagious before people know they’re sick, according to the state health department. The agency is urging residents to check their immunization records to ensure they are protected. On Jan. 18, Clark County declared its own local public-health emergency after the outbreak. Twenty-six of those suffering from the disease had not been immunized and the vaccination status of four others was unverified. Researchers called nearby Portland a “hot spot” for infections due to a high rate of nonmedical exemptions from vaccines, according to The Washington Post. Twenty-one of the 30 people infected in Clark County are under 10 years old, with eight between the ages of 11 and 18 and a lone case of someone between 19 and 29, according to the county’s Public Health Department. One person in Clark County has been hospitalized. Measles symptoms include fever, rash, cough and red, watery eyes, according to Public Health — Seattle & King County. The highly contagious disease can be easily spread through the air when an infected person breathes, coughs or sneezes. Those at the highest risk for complications include infants and children under 5, adults older than 20, pregnant women and people with weakened immune systems. 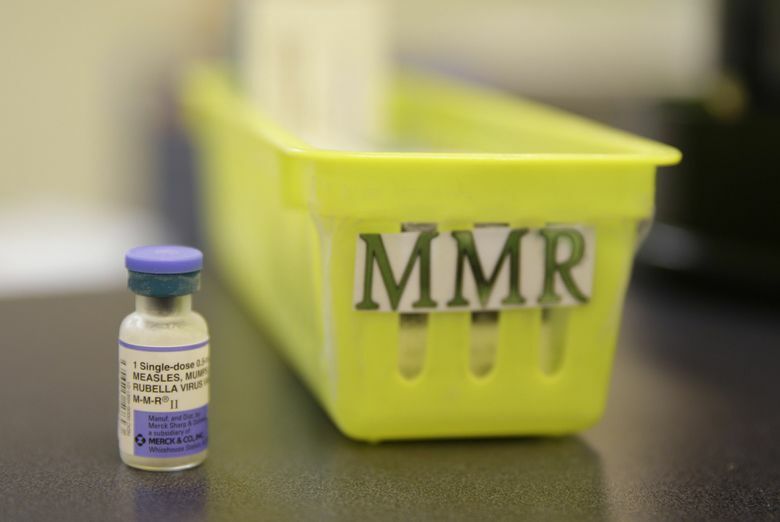 To avoid infecting others, Clark County Public Health urges anyone who believes they may have been exposed to measles or are experiencing symptoms of the disease to call a health-care provider, to discuss being evaluated before going to a doctor. The Centers for Disease Control and Prevention says two doses of measles vaccine, which are approximately 97 percent effective, will protect people for life. For those three out of every 100 people that are fully vaccinated but still contract the disease, the illness is likely to be more mild and they are less likely to spread measles to others. The CDC considers those born before 1957 to be protected from measles because they’ve been exposed to epidemics and have likely developed an immunity. Public Health officials have released a list of times and places in King County where nonimmunized people could have been exposed to measles, such as a Boeing construction site in Auburn, high-school basketball games in Kent and multiple medical facilities in Covington. Susceptible Clark County and Oregon locations include schools in Battle Ground and Vancouver, Portland International Airport and a number of churches.